You are probably familiar with the ripple effect. The term refers to a sequence of events that is triggered by a particular incident or occurrence. The most common example is dropping an object into a body of water…let’s say a stone in a lake. Once it falls, the stone causes a series of waves that spreads across the body of water, the waves ever expanding their reach. The metaphor is often used to describe the potential impact that our actions have on others and the world around us. At times, we may not even be aware of the ripples that we set in motion. There is no better way to describe the current opioid epidemic. Opioid dependence doesn’t just affect the individual user; it touches the lives of those around them, leaving its mark on children, family members, and friends. And it doesn’t end there. The ripples grow and extend to countless sectors. One system that is feeling the impact of the opioid epidemic is child welfare. Reports from public officials, advocates, and those working in the field echo the same sentiment – the current crisis is overwhelming. As opioid abuse continues to increase nationwide, the demand for foster care placements is also on the rise. This leads us to wonder what is the relationship, and what does it mean for families and future generations of children? There has been a sharp uptick in the use of opioids since 2010. According to SAMHSA, in 2016, 2.1 million Americans had an opioid use disorder (OUD). As that number continues to rise, so does the number of fatalities. The Centers for Disease Control and Prevention (CDC) reports that 115 Americans die from an opioid overdose every day. The number of children who have parents struggling with OUDs is unknown. However, a 2017 analysis yielded that 1 in 8 children resided with at least one parent who had a past year substance use disorder (SUD). The report also found that 1 in 35 children lived in a household with at least one parent who had an illicit drug use disorder. Unfortunately, it leads us to consider that parents are among those that we lose to the opioid crisis on a daily basis. Concurrently, as reports of opioid use rise, the demand for foster care placements across the country has also grown. The number of children entering foster care was on a steady decline for more than a decade; however, the tide shifted in 2012. From fiscal years (FY) 2012-16, the number of children in foster care nationally grew by 10%. While individual states varied, more than two-thirds experienced a surge in foster care caseloads during this period. Six states – Alaska, Georgia, Minnesota, Indiana, Montana and New Hampshire – saw foster care populations rise by more than 50%. Another recent development is the growing number of grandparents taking on the primary caregiver role. Generations United reports that about 2.6 million children – 3.5% of all children nationwide – are being raised by grandparents or relatives across the country. When we look at the data, 32% of children in foster care are being raised by kin, more than previous years. And that may be just the tip of the iceberg. It is estimated that for every child in foster care with relative caregivers, there are 20 children being cared for by grandparents or other family members outside of the foster care system. What contributes to the need for out-of-home placements? According to the latest national data, parental drug abuse is a factor in roughly one-third of all child removals. While the proportion of children entering foster care due to these circumstances appears to have remained steady over the past few years, it is increasing. Looking across the different categories for removal, drug abuse by a parent had the biggest percentage point growth between FY 2015 (32%) and FY 2016 (34%), which is notable in the face of the current epidemic. So…is there a relationship between the opioid epidemic and child welfare, and if so, what is it? It’s complicated. Given the timing of these trends, it is hard to imagine that increased opioid use doesn’t play some role in rising foster care caseloads. A recent national study found that counties with higher substance use indicators (drug overdose deaths and drug-related hospitalizations) have higher rates of foster care entry, indicating a relationship between child welfare caseloads and substance use prevalence. However, we have to remember that correlation does not automatically equal causation (proof that what you learn in statistics will come back around) since we can’t control for all demographic and socioeconomic factors and their potential influence on out-of-home placements. Even though the increase in foster care and relative care placements has been attributed to the opioid epidemic, empirical evidence to prove cause and effect is lacking. This is in part due to the way that the federal government and states track data on child removals, more specifically the contributing factors. For example, there is national-level data on the number of children being removed due in part to parental drug abuse, but it isn’t broken down in a way that shows what type of drug was being abused. Therefore, there is no way to know how many foster care placements stemmed from opioid abuse versus the abuse of another type of illicit drug. Nonetheless, public officials, advocates and others working in the field are making a direct link between the opioid crisis and increased demand for out-of-home placements. Anecdotally, there are similar accounts across states of the opioid epidemic and its impact on communities. Child welfare agencies are seeing more children come into care because of parental opioid abuse, and children entering the foster care system are getting younger and younger. It has been reported that there aren’t enough foster homes to meet the growing need. Caseworkers are feeling overwhelmed by growing, multifaceted caseloads. When we look at the most recent statistics, the largest proportion of children entering the foster (18%) are under the age of one. What Does This All Mean For Children and Families? Let’s take a step back. To understand the ripple effect of the opioid epidemic, we have to first look at how parental substance abuse impacts child and family outcomes. At a foundational level, parents struggling with a SUD may not be able to provide for a child’s basic needs (e.g., appropriate supervision or nutrition). Equally troubling, a child can be deprived of emotional support and positive attachment, critical factors in healthy childhood development. Inconsistent parenting inevitability hinders stability in the home. For a child, life can become chaotic and unpredictable, both of which are associated with negative outcomes. That is why parental substance abuse is a known risk factor for child welfare involvement. A 2016 study found that when compared with their peers, children whose parents faced SUD-related issues were three times more likely to experience abuse (physically, sexually, or emotionally) and four times more likely to experience neglect. We know that trauma experienced early in life can adversely impact a child’s development and have long-term health consequences, and parental substance abuse is a one form of childhood trauma (aka an adverse childhood experience or ACE). Often, substance abuse is compounded with other types of adversity, making the severity of potential negative outcomes even worse. Research shows that history has a way of repeating itself. Children who grow up with complex trauma are more likely to struggle with substance-related issues. One study found that individuals with five or more ACEs were seven to ten times more likely to have issues with illicit drug use. Other explorations into the topic have yielded similar results. There are a host of reasons why people with past trauma experience are more vulnerable to developing a dependence on substance use. While not all children will experience such consequences, the risks to future generations are far too great and warrant immediate intervention. In order to break the cycle, we have to find a way to address the opioid epidemic that is trauma-responsive. The child welfare system is poised to be a catalyst for change. Agencies are tasked with protecting children from maltreatment, abuse, and neglect, and in-home services play a critical role. In-home services are aimed at promoting the well-being of children by ensuring safety, achieving permanency, and strengthening families. When faced with familial challenges, keeping children with their parents is optimal (as long as it is safe and appropriate). Children do best in families with the support of at least one caring adult. Even in crisis, children can thrive when the right protective factors are in place. Removing a child from his or her home disrupts daily life and expectations. All of that instability can be traumatic. The stress that stems from coping with parental loss can have long-lasting effects on a child’s emotional, behavioral, and academic outcomes. 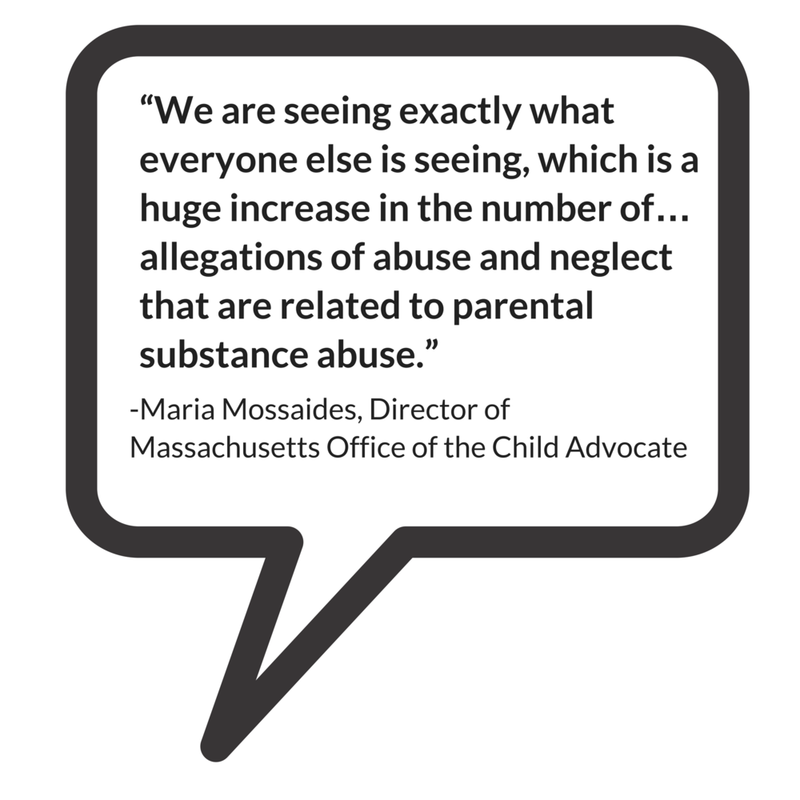 Parental substance abuse has long been an issue for child welfare agencies, one that is now amplified by the recent opioid epidemic. Child welfare agencies across the country are inundated with high caseloads. The complexity of the cases given the unique circumstances and service needs of families battling opioid dependence are adding another layer to an already challenging situation. Not to mention, family stabilization and/or reunification is complicated (contender for understatement of the year). Despite what we know about keeping families together, having children remain with their parents may not be in their best interest due to the impact that substance abuse can have on parenting, making out-of-home placements the safest option. What’s more, reuniting children with their parents can be tricky given ebbs and flows of recovery. The tug-of-war that this creates for caseworkers can be challenging to navigate. So, how do we support those working with families experiencing the crisis firsthand? States and localities are getting creative and implementing interventions that have proven effective for families, recognizing the trauma associated with parental substance abuse. There is ample support for family-centered treatment for substance abuse, including opioid dependence. Additionally, program models that focus on systematic change and cross-system collaboration have also been linked with favorable outcomes. Sobriety Treatment and Recovery Teams (START) is an intensive, integrated program for families experiencing co-occurring substance use and child maltreatment. START launched in Cleveland, Ohio in 1997 and extended to Kentucky roughly a decade later. The program matches up specially trained child protective services workers with family mentors (peer support specialists in recovery), behavioral health treatment providers, and the courts. The goals of the program are to ensure child safety and reduce the need for out-of-home care. A 2012 study on the impact of START on family outcomes found that mothers who participated achieved sobriety at a higher rate than those in more traditional treatment programs. Children were also placed in the custody of the state at half the anticipated rate. Medication-assisted Treatment (MAT) – an approach that combines medication with counseling and behavioral therapies – is a best practice, and has been linked to decreases in negative outcomes (e.g., opioid use, opioid-related overdose deaths, criminal activity, and infectious disease transmission) and increases in social functioning and retention in treatment, two factors that play heavily into improved parenting skills. MAT has also been found to be effective in providing care for pregnant women who struggle with opioid dependence. Despite some misconceptions in field out the approach, MAT has been associated with improved prenatal care, reduced illicit drug use, and better neonatal outcomes. Family Treatment Drug Courts (FTDCs) are specialized courts that respond to cases of abuse and neglect involving caregiver substance misuse. Using a family-friendly approach, FTDCs combine judicial oversight and comprehensive services by bridging together substance use treatment, child welfare services, community supports, and the court system. The unique model balances the rights of both children and parents and aims to create safe family environments while treating the parents’ underlying substance use disorder. In 2015, there were a reported 300 FTDCs across the country, with models and implementation varying state-to-state. The benefits associated with FTDCs include higher participation rates and longer stays in treatment (when compared with non-FTDC participants). The model also yields positive child outcomes; children reportable spend less time in out of home care and are more likely to be reunified with their parent(s). Child welfare agencies are first responders to families in crisis. Caseworkers can encounter stressful or traumatic experiences working with families opioid dependence, witnessing the aftermath of a parental opioid overdose is just one devastating example. That is why supporting frontline staff is imperative. Reports indicate that there can be gaps in knowledge among caseworkers around the needs of families with substance use issues and the treatment of opioid use disorders. Training and support in these areas is critical for those working in the field. Additionally, specialized training around recognizing and responding to trauma and trauma-informed care practices is needed when working with families impacted by opioid abuse, as there can be long-lasting negative effects for children if trauma symptoms go undetected and untreated. providing adequate supervision and staff coverage. Families with substance use issues frequently face other risk factors. Collaboration with other service providers is crucial in helping link parents and their children to the services that they need. The surge in opioid use has trickled into a number of child and family-serving systems. As such, agencies should take steps whenever possible to develop partnerships in their communities to support the work. The crisis is too far-reaching to not have a comprehensive, coordinated federal plan of action in place. Despite declaring a public health emergency, we have yet to devote the level of funds that are needed address opioid dependence. While social service providers and child welfare agencies continue to try and mitigate the impact on a local or state level, the importance of allocating appropriate federal resources to support these efforts cannot be overlooked. For example, the Maternal, Infant and Early Childhood Home Visiting Program (MIECHV) funds home visiting programs that aim to promote positive parenting practices and healthy parent-child interactions. These programs can also link parents struggling with substance dependence to appropriate treatment providers. Research shows that no matter what level of care is needed, the most beneficial approach is the one that treats families together. MIECHV could help address the unique service needs of the growing number families impacted by opioid dependence. The Family First Prevention Services Act (FFPSA) may also be a way for federal resources to help child welfare agencies respond to the epidemic. FFPSA is poised to dramatically overhaul the child welfare system, putting federal dollars toward prevention programs and interventions aimed at keeping families together. Substance use treatment programs are among the services that can be prioritized through the restructuring of funds. 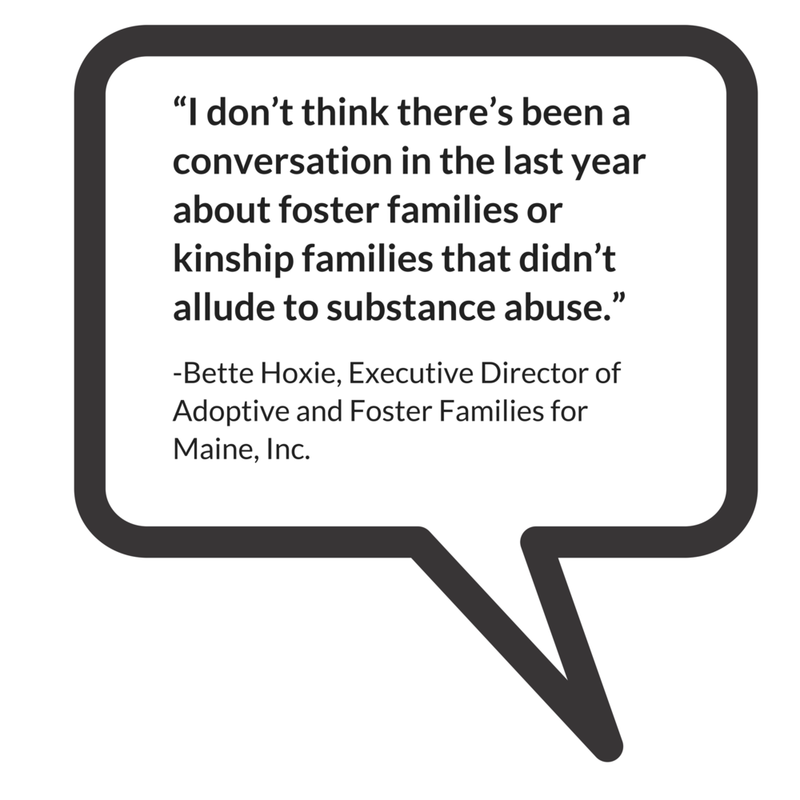 Additionally, given the increased demand for foster care and relative caregiver placements, advocates are calling to strengthen foster parent recruitment and retention efforts and kinship navigator programs. Increasing capacity in these areas will in turn aid child welfare agencies in finding safe, appropriate placements for children impacted by the current crisis. There are a variety of other ways that programs and policies could provide relief at a national level; however, equally important is the need for improving data collection across various systems to make informed and evidence-based decisions. It is hard to stop once it gets put in motion. But that doesn’t mean we shouldn’t try. While the current crisis is overwhelming, there are proposed solutions, ones that can positively impact families and change the course for future generations. We encourage you to share your thoughts on this important issue. How has the opioid epidemic impacted your community and the children and families you serve? What has been the response? Share your feedback in the comments below! Sabrina Harris is an Accreditation Coordinator at COA with a background in child advocacy and family policy. She has been a member of Team COA since July 2012. While her ultimate aspiration is to be a Golden Girl, Sabrina is committed to helping nonprofits implement best practices in her current role. She resides in Brooklyn, New York, but still refers to Cleveland, Ohio as home. Outside of the hours of 9 to 5, she is most likely binge-watching Netflix or strolling around her South Slope neighborhood listening to music and getting her coffee fix.